great to understand families better, but we need to be doing things together too. So here is a game that our family loves to play. It is quick, easy, any age can play (our 18 month old loves this game), and it is fun. Materials: All you need is a piece of paper and a big bag of candies or snacks like M&M's, Skittles, Cheerios, or Goldfish. I have even used peas and cut up carrots when I am trying to get the kids to eat more veggies. Put a piece of candy, or snack in the middle of each square. Send one person out of the room. Everyone remaining in the room agrees on which square with its piece of candy will be "Pete". As soon as the person picks up "Pete" everyone at the table yells "DON"T EAT PETE". That ends the person's turn. Fill each square with new candies, send someone else out of the room and decide on a new secret square. Object: The object is to try and eat every piece of candy, leaving Pete until the very end. 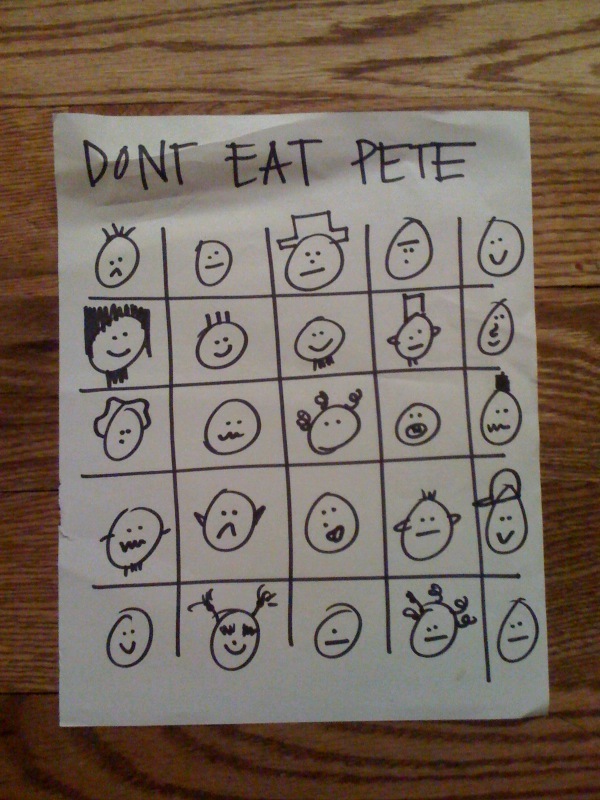 Kids love this game, they love to yell "Don't eat Pete". If you decide to play, let me know. I would love to hear how it goes at your house. Someone made this for us for a Conference weekend. My kids thought it was great! This sounds like such a fun game for FHE! This was one of my favorite games as a kid! My mom had made our board from a colored file folder, with 9 squares. The pictures of "Pete" were little guys made out of different candies. Then she laminated it, and it could fold up normally and store in the filing cabinet. And now that I just realized that I don't have a copy for my own little girl, I am going to put that on my list of things to do this weekend! Seriously one of our favorite household games...but I'm not quite the artist you are and so we just do either numbers or colors or shapes to try and help the kidlets learn their numbers/colors/shapes/etc. we play this game a lot too. only, i made our boardgame with photos of family members. 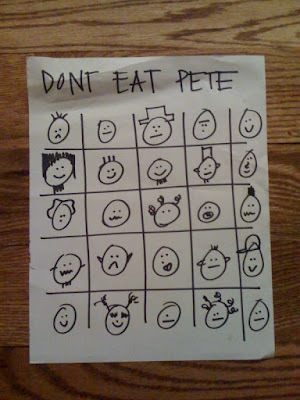 instead of don't eat pete, we yell "don't eat your family!" the kids LOVE it! saw this entry last week and tried it this weekend. we used teddy grahams and my two-year-old (while at times may get so excited he blurts out where pete is before my husband guesses) just LOVED it. he loved it. he loved drawing the silly faces, yelling out not to eat pete and of course getting the snacks. great idea. so easy. plan to play it at an upcoming reunion when i'll be watching several of the kids at once.